When I was first introduced to the wonders of Morrissey’s live show back in 2002, I didn’t know his solo songs very well. Now I know that he sang quite a few songs from Viva Hate, an album that was at the time 13 years old; this strikes me as a pretty unusual choice for many performers, but then, Morrissey is special, and he knows it. 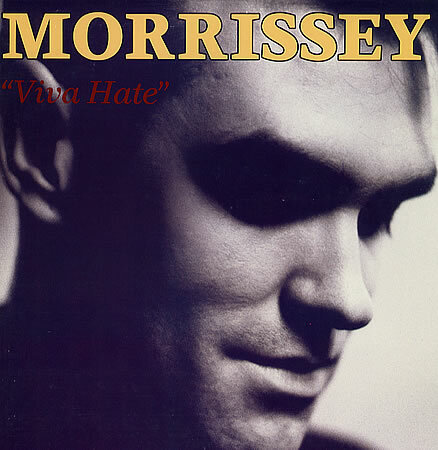 Morrissey always has a way with words, but this album has quite a few songs that conjure up detailed images as well. It’s easy to see the disco in Bengali in Platforms, the seaside town that they forgot to bomb in Everyday is Like Sunday, the washed-up nervous juvenile in Little Man, What Now, the busy scissors in Hairdresser On Fire, and the very naughty inappropriate relationship in Alsatian Cousin (Do you see a male or female student in that song? I know which one I imagine). But, as usual, there’s that great wit. In the aforementioned Alsatian Cousin, Moz sneers “Were you and he lovers? And if you were, then say that you were! On a groundsheet, under canvas, with your tent flap open wide.” I love the intriguing imaginary visuals of what’s going on in that tent and the impression one gets that the tent flap could also refer to another man’s fly. One of my favorite Morrissey lyrics ever, and I think one of his most intentionally funny, is on Late Night, Maudlin Street when he says “No, I cannot steal a pair of jeans off a clothesline for you. But you… without clothes, oh I could not keep a straight face. Me – without clothes? Well a nation turns its back and gags“. The cultivated melodrama of that line cracks me up every time. I also love I Don’t Mind If You Forget Me’s “Your ‘My best wishes’ – they make me suspicious”. With Alsatian Cousin’s power-laden inappropriate student-teacher relationship (and odd dog references), the whip-cracking percussion on Late Night, Maudlin Street, the fetishism of the power of cutting hair in Hairdresser on Fire, Morrissey’s proclivity to get extremely microphone-cord-whippy when he sings Suedehead, the guillotine sound effect that ends the album, and the creepy weirdness of the album title itself, the sadomasochism theme seems pretty intentional. Like all things Morrissey, it’s wonderful pain and punishment.